Sometimes we just need a solid dose of inspiration and imagination to get us through the day. 'Life's Little Things: The Quotes' is just that. Cendrine Marrouat's play between imagery and prose is simple, sweet, succinct and good food for the mind and soul. Cendrine Marrouat's 'Life's Little Things: The Quotes' is another work of art, and a byproduct of excellent execution through photography. This 34-page collection tells a story from the very start to the very end. Cendrine pays close attention to detail and each photograph is a dramatic photograph that encapsulates the imagination. Her work is not just good but excellent. The pictures all tell a story, capture a moment in time and they speak to your emotions. I was fortunate to meet Cendrine a couple of months ago and enjoyed her work so much I wanted to feature her work on Nevue Fine Art. She introduced me to her new book, 'Life’s Little Things: The Quotes'. 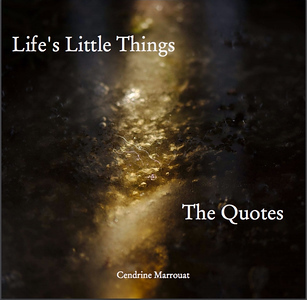 In the book 'Life's Little Things: The Quotes', Cendrine Marrouat combines many different elements. It is part auto-biographical, and All-in-all, it is a gorgeous book that I highly recommend everybody to invest in. As I often say, “Buy books, not gear.” I think books like this are good motivators. After finishing the book, I was inspired to shoot– and I’m starting to shoot more. I highly recommend every photographer and/or person invest in 'Life's Little Things: The Quotes' by Cendrine Marrouat. It is easily one of my top 5 photography books at the moment– and a book I shall keep forever and cherish, and go back for inspiration in terms of images, the photography, and personal quotes. What I really love about Cendrine Marrouat's delightful book of photographic art and words of wisdom is that it appeals more to the heart and less to the head. In today's technology age, we're inundated with factual and technical information; but here's a book ('Life's Little Things: The Quotes') that spreads pearls of profound and timeless wisdom and reminds us of the beauty and joy of existence. What I really admire about this book is the fact that Cendrine draws upon the lessons that the world, especially nature, offers us. Some of the examples she mentions include a caterpillar as an example of flexibility, light driving out darkness, and seeing opportunities in trials and tribulations.